The Hawke Endurance ED 20-60x85 Spotting Scope offers superb optical quality. 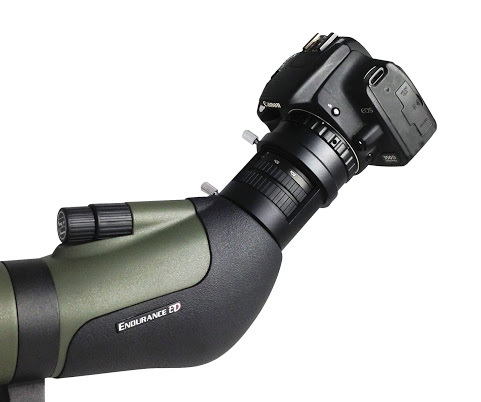 Endurance Endurance ED spotting scopes feature a twist-up eyecup standard on the zoom eyepiece. You can use the eyecup at any position between the full up or down position, whichever is more comfortable. Endurance ED spotting scopes have a dual focus knob system. Once you reach focus with the large (coarse) focus knob you can use the small focus knob (fine) to achieve a very sharp image. To make the spotting scope more convenient and comfortable to use, the Endurance ED is fitted with an adjustable mounting foot that may be rotated to any position in a range of about 180 degrees. The twist-out sunshade is designed to block unwanted glare and other reflections that can spoil the viewing image.